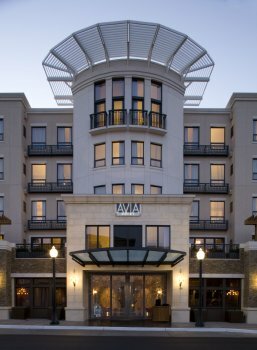 AVIA Napa CLOSED 1450 1st St., downtown, (866) 644-2842, (707) 224-3900. 141 rooms; 5 stories. Some fireplaces. Fitness center next door. Afternoon snack; restaurant; room service. No pets. Self-parking free, valet parking $15. Featuring a style of architecture that blends with the brand-new construction all around it, this sleek and stylish hotel has a comfortable, pleasantly decorated lobby in the lime green-chocolate-merlot color scheme used throughout. Among 16 different types of rooms are Double Kings for families (kids stay free) and Master Tub Suites with a two-sided fireplace and soaking tubs for two. Bathrooms are lined with eastern white marble, and each has a walk-in shower. An expansive guests-only second-floor wood deck terrace features a fire pit, porch swings for two, and comfy canopied lounges, and it twinkles with tiny lights in the evening. Guests get complimentary access to a large fitness center next door that has a pool, hot tub, and sauna. Guests gather in the spacious, open AVIA Kitchen and Wine Bar (B&D daily; $$.) from 5 to 6 p.m. for complimentary “bites and flights,” which pairs light snacks with a sampling of wines poured by a local winery rep. The restaurant’s evening menu features small plates and a wine list that includes small vineyard exclusives. Also, an inviting bar operates in a corner of the lobby.